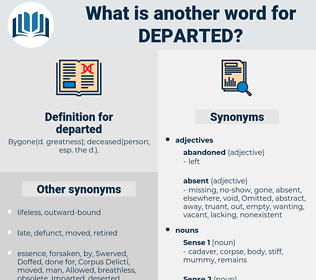 What is another word for departed? Bygone( d. greatness); deceased( person; esp. the d.). Deviated, Deported, Withdrew, Disappeared, Arrived, traveled, travelled, terminated, Proceeded, retreated, Emigrated, Ceased, abandoned, started, traded, stopped, derived, retired, disregarded, Vacated, Rode, postponed, retracted, Fled, erupted, escaped, Eliminated, broke, Retrieved, removed, resigned, Differed, produced, Commenced, Extracted, faded, Emerged, dropped, Flew, rejected, collapsed, split, Stepped, moved, Sailed, dismissed, discarded, ended, Renounced, ignored, Stood, subparagraph, Skipped, Eloped, divorced, Ranged, Died, headed, Came, rushed, egressed, Walked, Returned, Began, Shifted, portion, Took, Were, lifted, Jumped, Poured, HIT, dumped, chased, Launched, shut, Marched, party, Parties, pulled, turned, Resulted, output, dismounted, Passed, Ditched, gone, Went, Brought, Discounted, Ran, Yanked, missed, Became, quit, Quitted. existent, operative, extant, existing, breathing, functioning, present, vivacious, animated, lively, going, animate, vital, thriving, vibrant, future, running, quick, dynamic, alive, active, live. No one could have entered until the servant departed. But now the departed vision has returned! deferred, deport, depart, defraud, deportee, date bread, deep-fried, divert, depardieu, dihybrid, deep red, deep-rooted, diverted, duty period.